Signing an international star is an exciting time for a team, the players and fans. It's also a time to make a shitload of money. One Texas Rangers fan tried to do just that, even getting a hand from catcher Mike Napoli. 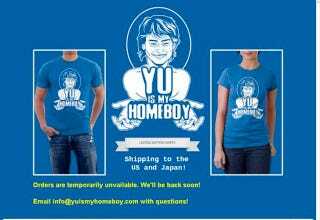 Eric Vaughan created a send up of the "Dirk is my homeboy" shirts using Rangers star acquisition Yu Darvish as his muse. He got a little boost in business when Mike Napoli wore one of the shirts to a press conference following Darvish's Major League debut. The Darvish camp, however, is not happy about some random fan cashing in on the phenom's popularity. The Wasserman Media Group, which represents Rangers pitcher Yu Darvish, sent a cease-and-desist letter to shirt entrepreneur Eric Vaughan of Allen. Wasserman also sent a copy of the letter to Big Cartel, the online firm that handled the business of processing the orders. Apparently, Big Cartel pulled the plug on sales of the shirts [Friday]. Vaughan has lawyered up (he hired the lawyer previously used in articles as an expert on the matter) and is going to fight for the "Yu Is My Homeboy" shirt. His lawyer thinks he's got a good chance to succeed, noting that Big Cartel has allowed the Vaughan to address some of the issues in the cease and desist letter. Darvish stands to make at least $56 million off the Rangers, and who know what else more off the fans' support so, hey Yu, why not cut the guy a break?